Newly manufactured by Prvi Partizan, this product is brass-cased, boxer-primed, non-corrosive, and reloadable. It is a great choice for self-defense at an economical cost. 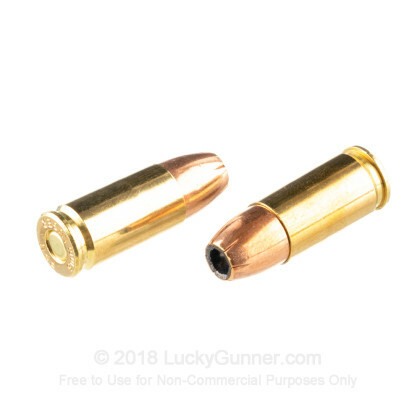 The jacketed hollow point bullet provides excellent stopping power for when you need it most. Prvi Partizan is a European cartridge manufacturer that has been in the precision cartridge business since 1928. 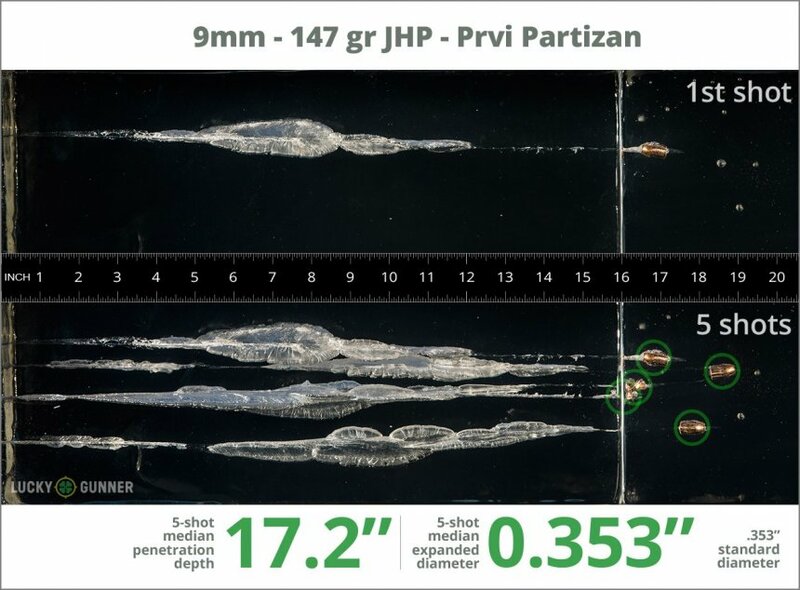 We wanted to know exactly what happens to a self-defense handgun bullet on impact, so following FBI protocols, we fired five rounds of Prvi Partizan 147 gr JHP from 10 feet, through four layers of cloth (to simulate clothing), into synthetic ballistic gelatin. The photos below show the bullets recovered from the gelatin after being fired from a Smith & Wesson M&P9C pistol. There’s also a high speed video that shows the bullet impacting the gelatin block. All the data we gathered pertaining to expansion and penetration of this load can be found in the chart below, and the diagrams at the bottom of the page show how it compares to other 9mm Luger (9x19) self-defense loads from our tests. 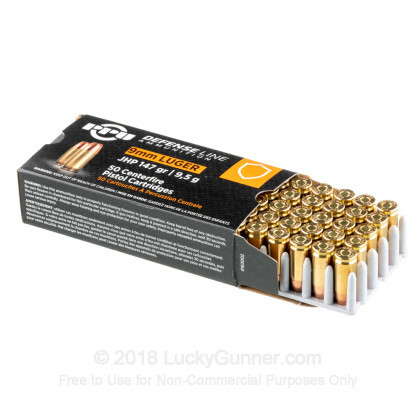 In addition to the 9mm Luger (9x19) Prvi Partizan 147 gr JHP, we tested over 100 other self-defense loads, so check out Lucky Gunner Labs for the full story. 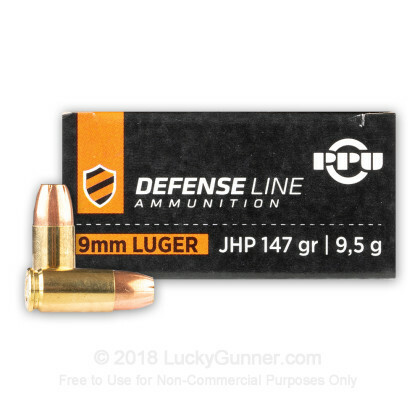 How do the results for this Prvi Partizan 9mm Luger (9x19) compare to other 9mm Ammo? 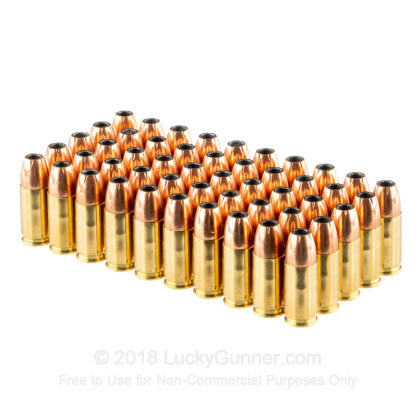 0.90" This ammo: 0.35" Min: 0.32" Median: 0.50" Max: 0.90"
17.2" 0" 5.6" 17.7" 47.5" This ammo: 17.2" Min: 5.6" Median: 17.7" Max: 47.5"
Has fired consistently in both my 9mm pistols, neither one a hi-point, couple of boxes and nary an issue. Wouldn't be afraid to purchase again. Got tired of clearing the jams. Every third or fourth round hung up. Used FMJ round nose shells and have had no jams in 300 rounds. 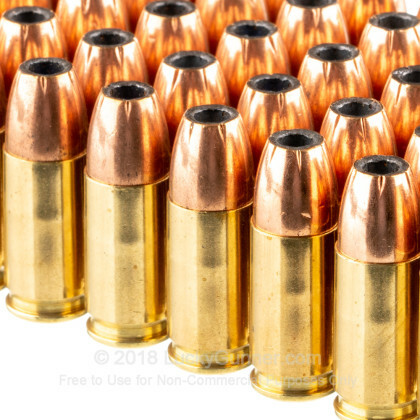 Ammo shoots well for a russian made. Clean and no issues at all. 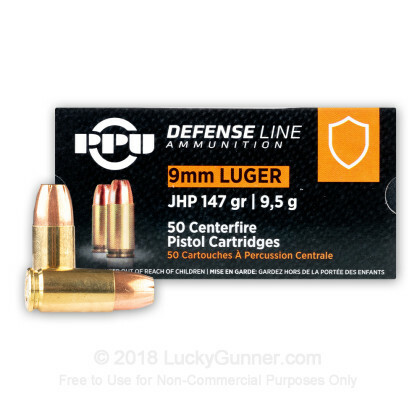 Please click here for our current in stock specials on 9mm Luger (9x19)!